By purchasing a Meet and Greet ticket for the screening of Quadrophenia, ticket holders are granted reserved front row(s) seating, backstage access to meet the cast for signings and photos after the screening and gifted a Quadrophenia goodie bag. The Meet and Greet ticket purchaser's name will be on a list on entry to the venue, please bring proof of your purchased ticket. M&G tickets are available to purchase for the daytime screening at 15:30 and the evening screening at 19:30. 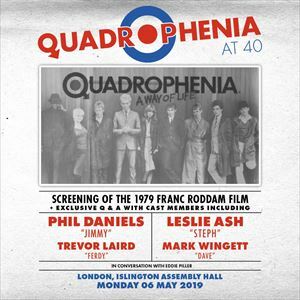 Thank you for purchasing Quadrophenia's 40th anniversary screening Meet and Greet tickets, we hope you enjoy the event. + exclusive Q & A with Phil Daniels ("Jimmy"), Leslie Ash ("Steph"), Mark Wingett("Dave"), Trevor Laird ("Ferdy") in conversation with Eddie Piller. "Quadrophenia" is a 1979 british drama film based on the 1973 album of the same name by The Who. The film stars Phil Daniels as "Jimmy", a young 1960s London-based Mod who escapes from his dead-end job as a mailroom boy by dancing, partying, taking amphetamines, riding his scooter, and brawling with the motorcycle-riding Rockers, accompanied by his Mod friends "Dave" (Mark Wingett), "Chalky" and "Spider". He discovers one of his childhood friends "Kevin" (Ray Winstone) is now a Rocker and he discovers him attacking one of his Mod friends one night. The Mods vs Rockers violence escalates on a Bank Holiday trip to Brighton. This is where "Jimmy" meets a girl he has a crush on "Steph" (Leslie Ash) and they see the 'Ace Face', played by Sting, for the first time. The excellent British cast also includes Trevor Laird ("Ferdy"), Gary Shail ("Spider"), Michael Elphick ("George Cooper"), Toyah Wilcox ("Monkey"), Philip Davis ("Chalky"),Timothy Spall ("Harry") and many more.